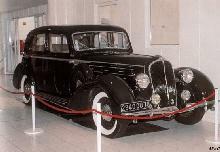 The 135 was the principal model from Delahaye for a substantial period of time. The cars were mainly supplied as rolling chassis to be equipped with magnificent bodies. The 3,557 cc six-cylinder engine delivered 95 bhp at 3,200 rpm.